Chakras are the psychic energy centres of your body. Yoga practitioners often refer to the chakras as 'Lotus flowers'. This is a very good way to visualise your chakras, particularly when opening them up or closing them down. Opening a chakra can be likened to a Lotus flower opening up its petals. When closing down the chakras, it’s useful to visualise the chakra as a Lotus flower closing its petals so they become tightly shut. Each of the Seven Major Chakras is associated with a different colour, each one relates to several different parts of the human anatomy. Blockages within a chakra energy flow may lead to an imbalance and to a mental, spiritual or physical disorder in that part corresponding part of the body. Physical, mental or emotional injuries may cause cracks, breaks, shrinkage or demormities in the chakras. 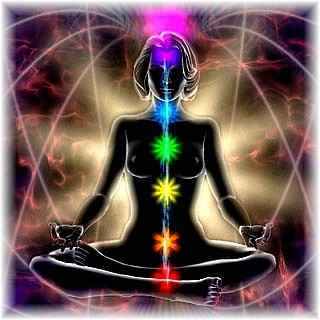 Chakra balancing is used to restore balance and harmonise the energy in the chakras. In Crystal Healing suitable crystals are placed over chakra points. Each chakra is linked to one or more crystals, and most chakras have an element associated with them. Psychic abilities are also linked to each chakra, so it's important to know a little about chakras, if you are interested in learning psychic awareness. FIRST Chakra colour is RED, its element is EARTH. This chakra, known as the BASE or ROOT, is felt at the base of the spine. This chakra opening points down to the Earth, so energy can be drawn upwards into the body through this opening. Psychically the Root chakra assists us to stay grounded and brings information from other dimensions into ours. Parts of the anatomy associated with this chakra are the kidneys, the spine and adrenal system, but this chakra also affects the physical (rooted) part of us, and our relationship to nature. It represents our life force (prana) and our energy. Conditions said to be associated with blockages within this chakra are irritable bowels, haemorrhoids, constipation, sciatica, joint stiffness. Crystals associated with Base or Root chakra are ruby, red garnet, smokey quartz and black obsidian. SECOND Chakra colour is ORANGE, its element is WATER. This chakra, known as the NAVEL OR SACRAL chakra, is located just below the navel. Parts of the anatomy associated with it are the reproductive system (gonads, testes and ovaries), but it also influences sexuality (not just sexually, but the way in which we form our non-intimate close relationships). Conditions said to be associated with blockages in this chakra are hormonal imbalance, impotence, infertility and fungal infections. Crystals associated with the Navel or Sacral chakra are calcite tiger's eye and carnelian orange. The Sacral chakra opens us up to Empathy and Intuition when used psychically. THIRD Chakra colour is YELLOW, its element is FIRE. This chakra, known as the SOLAR PLEXUS chakra, is located below the breast bone. Parts of the anatomy associated with it are the nervous system, stomach, liver, gall bladder, but it also influences emotions like will power, determination and our sense of destiny. Conditions said to be associated with blockages in this chakra are eating disorders, diabetes, stomach disorders, ulcers, indigestion and gastritis. Crystals associated with the Solar Plexus chakra are citrine topaz and golden calcite. When working psychically, the Solar Plexus chakra is used to pick up instinctive 'gut feelings'. FOURTH Chakra colour is GREEN (also PINK) its element is AIR. This chakra, known as the HEART chakra, is located in the middle of the breast bone. It affects our heart, thymus, lungs and circulation but also influences personal love and universal, unconditional love issues. Conditions said to be associated with blockages in this chakra are heart and blood pressure problems and allergies. The Heart Chakra is used psychically when undertaking healing, psychometry or spiritual work that involves compassion. Crystals associated with Heart chakra are rose quartz, kunzite, watermelon, tourmaline, jade, emerald and adventurine. FIFTH Chakra colour is BLUE (sky blue not dark blue). Associated element for this chakra is a new one called Alcasa (gateway to liberation). Symbol for Alcasa is a triangle inside a circle. This chakra, known as the THROAT chakra, is located in the hollow of the throat. It affects thyroid, vocal and bronchial areas. It also influences speech and communications. Conditions said to be associated with blockages in this chakra are sore throats, laryngitis, tonsilitis and tinnitus. The Throat chakra is used psychically for channelling, inspirational speaking and clairaudience (as ears and throat are connected). Crystals associated with the Throat chakra are aquamarine, sodolite and turquoise. SIXTH Chakra colour is INDIGO (INDIGO). This chakra, known as THE THIRD EYE, is located in the middle of the forehead. It has no associated symbol because this chakra transcends all that is physical. It's linked to the nervous system, the left eye, ear, nose, pituitary gland and lower brain. It can be referred to as our 'knowing sense' because it helps us visualise higher concepts. Conditions said to be associated with blockages in this chakra are nightmares, snoring, migraines, dental problems and disturbed sleep. The THIRD EYE chakra is the psychic centre responsible for clairvoyance, psychic sight, precognition, dreams and imagination. Crystals associated with the Third Eye chakra are lapis lazuli, blue sapphire, blue fluorite. Seventh Chakra colour is VIOLET. This chakra, situated at the top of the head, is known as the CROWN chakra. (It’s often shown as WHITE as well as Violet). This chakra allows cosmic energy to flow in and through our bodies. It has no element because it’s not earthly. This chakra has a higher vibration which connects us with Spirit and Higher Spiritual aspects. It affects the upper brain and pineal gland. Conditions associated with blockages in this chakra are insomnia, headache, stress, anxiety and fear. Crystals associated with the Crown chakra are amethyst, clear quartz and oregon opal. I hope this information will help beginners learn what chakras are, and how these chakras relate to their psychic senses. (Reiki includes a chakra breathing technique. and can also be used for chakra balancing. If you'd like to post any further Chakra information, or would like to share your Reiki experiences particularly those regarding chakra balancing, or breathing, please feel free to do so).